The crabapples are blossoming, and Etter 16-32 (Thornberry) has these big, pinkish-purple petals that are gorgeous. I wish I had a standard-sized tree of it in the front yard. They don’t have any fragrance, but it doesn’t matter, as the neighborhood orange trees are also blossoming with one of the sweetest fragrances on earth. We get the beauty of the apple blossoms and the aroma of the orange blossoms, the best of both worlds; it almost doesn’t seem fair. 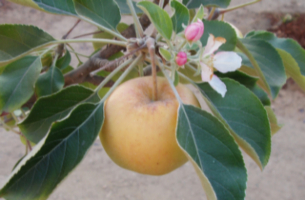 This blog is my journey in growing apples in the warm climate of Southern California where the traditional crop is citrus, thus the name Apples and Oranges. For years we were told by university master gardener programs and agriculture extension agents that apples would not grow here except for a couple “low chill” varieties like Anna. No only do a hundred varieties grow here, but they’re outstanding, and do incredible things like blooming again, right next to the fruit as in the photo above. Hopefully this will be an inspiration to those of you who have been told (by highly educated people no less) that you cannot do something.